We all have role models – those people that we look up to and aspire to be. Perhaps they are those who are closest to us, such as our parents, teachers or best friends. But oftentimes these are people who are credited for great successes like famous actors, scientists, politicians or otherwise. Have you ever just wanted to be them, to think like them, to live life through their eyes? Well, through the Raikov Effect, this is deemed possible. The Raikov Effect, based on (and named after) the research of scientist Dr. Vladimir Raikov, claims that you can legally ‘steal’ the talents of any genius simply by manipulating your mind. But before we jump into the product at hand, let’s take a look at Dr. Raikov, his experiments and how he came to this startling epiphany. Back in the 1960’s and 1970’s, Dr. Raikov was performing experiments with his partner and Czech psychologist Dr. Milan Ryzl. Raikov and Ryzl focused mainly on the mind and it’s inter workings. Through one particular experiment they discovered that it was possible to ‘trick’ someone into thinking they were someone else entirely. Through basic hypnosis and suggestion, these scientists found they could influence people into believing they were someone they were not – even someone as genius as Albert Einstein. But what about when the trance fades and the illusion is gone? Surely it’s impossible to think our only way to discover success is by being under constant hypnosis? Well, what Raikov also discovered was that the skills associated with the hypnotized persona would remain after the subject came out of the hypnotic trance. This meant that even if the subject was no longer under hypnosis and no longer believed they were person, they kept some of the skill associated with that individual. So, for example, let’s pretend that there was a talented soccer player that someone admired and wished to be. Under hypnosis and suggestion, that person would become that soccer player and, even after this hypnosis was finished and that individual returned to everyday life, they still held onto some of the genius of that soccer player. While this doesn’t mean that person would immediately become a soccer professional, they would have an upper hand and better understanding of the sport. It would be more likely that they would be capable of jumping from beginner soccer lessons to advanced lessons at a much faster pace than his or her peers. And while hypnosis is still being validated in the scientific world, some experts argue that it isn’t even necessary to perform this kind of experiment. This “artificial reincarnation” can be accomplished simply by diving into basic neuroscience and learning a basic mental technique – which is where The Raikov Effect comes in. Times change and so do scientific approaches. While hypnosis was the basis of ‘stealing’ the genius of another person in the past, today’s experts have found easier methods – ones that can be performed solely by the subject. The easier way to achieve this – and the basic behind The Raikov Effect – is through neuro-linguistic programming or NLP. NLP is better understood when it is broken down. Therefore, NLP is, in essence, learning the language of your mind. This is very similar to the idea of learning a language from another culture. For example, if you are talking with an individual from a foreign country, you may think you are being very straightforward and clear about what you are asking or telling them. However, language is complicated and a lot of the times meaning can get lost in translation. The same thing can happen with your mind. You may believe you are manifesting positive things into being – telling your brain to be happier, garnering the tools to be more successful, have more money, be introduced to romance, etc. However even these thoughts we send to our brain can get lost in translation. This means that figuring out how to communicate with your subconscious mind can make or break the goals and aspirations you have in life. In its essence, NLP is the study of excellent communication with others but, even more importantly, with yourself. It is an attitude and a methodology of knowing how to achieve your goals and get results. So how can you use NLP to create The Raikov Effect? One of the beginning techniques to be practiced is anchoring. The idea behind anchoring is that you create a physical trigger that launches you into a particular mental state. This is a small movement that communicates something to your brain. For example, when we rub our eyes, this communicates we are tired. When we are thirsty, we reach for a glass of water. It’s important to associate a movement with your genius state that can be done inconspicuously and in public. Tapping your foot, scratching your ear, touching your index finger to your thumb are all possible movements you could potentially associate with your genius state. They do not have to be complicated and, in fact, it’s better if they are not. But anchoring is just one possible way you can enter into The Raikov Effect. 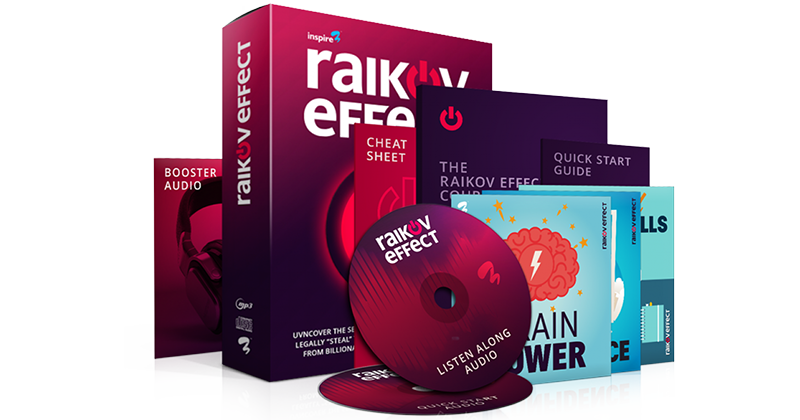 There are numerous tools and resources included in the Raikov Effect package to help you attain the insight you’ve been missing. It’s almost crazy to think that Raikov’s years of research and experiments could simply be bottled up, sold as a package to be used in-home and still be successful… but that’s what Raikov.com aims to do. The claims on the Raikov Effect website state that you can turn on any talent, skill or ‘genius’ you want instantaneously. These could include: creativity, motivation, power, confidence and so on. The idea is that you acquire the skills and the mindset of those who you admire most. Doing so will allow you to apply these attributes to your own life and achieve the goals you’ve been working towards. Included in your purchase is a detailed course to help you take on the traits or skills of an individual you admire – perhaps even some of the ones listed above. You can even watch a free video presentation that goes over the program and the research of Dr. Railov here. The sign-up process is simple and the course itself is self-explanatory and easy to understand. And the best part? This course isn’t specific to one particular goal or area of your life. Through this process you will learn the skills needed to enter the Raikov Effect and will reap its rewards it all areas of your life. The Raikov Effect is meant for anyone wishing to alter their mindset and gain the skills and intelligence of those they admire most in order to achieve their goals. One of the best aspects of the Raikov Effect is that it has no age, gender, culture or religious restrictions. It truly is a product for anyone who wants to work towards improving the communication with their mind. However, as is true with most products of this nature, there is a certain degree of believability and conscious effort that is required for this program to be successful. Coming into the Raikov Effect with skepticism and negative thinking can prevent you from unlocking its complete potential. Endless potential. One of the greatest aspects of the Raikov Effect course is that it’s teachings aren’t specific to one particular area of life. You will learn basic tools that can be applied in multiple situations – from your job, your love life, your family, your hobbies and more – so you can unlock real potential. The Raikov Effect price starts around $137. This includes everything in the course from the book to the audios to the 24/7 support. Money-Back Guarantee – The Raikov Effect does come with a one-year money back guarantee if you find the results to be unsatisfactory. There aren’t many downsides to giving the Raikov Effect a try. It’s one year money-back guarantee means you have 365 days to determine whether or not this product was successful or not. It’s also a great benefit that the basis of this product is backed by years of research and experimentation. This fact, combined with the implementation of the new NLP technology, grants the Raikov Effect more validity and promise. Law of Attraction teacher Bob Doyle says the following about the Raikov Effect program. At the end of the day, the only question you need to ask yourself is: are you wanting to take on the mindset and become the person you most admire? If the answer is yes, then the Raikov Effect is the product for you. And who knows – maybe after learning how to master this brain communication – you might become your own role model.